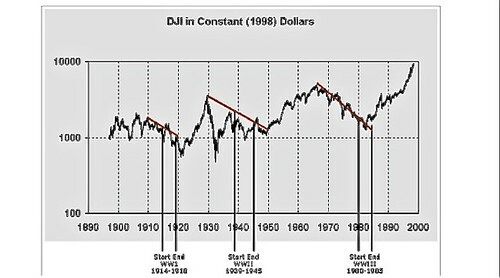 Are We Days from Dollar Disaster? Are we days from a US dollar disaster? This is such an urgent question, I posted a free report for all readers entitled “US Dollar Protection Review“. This report is quite long so here is an executive summary as it is important that you do not miss this part. Understanding multi currency investing is very timely and important. There are three factors that suggest there will be another significant US dollar fall. If the dollar weakens… everything Americans buy abroad… which is a lot… will cost more. Interest rates may rise and business may suffer. Factor #1: Economic recovery. Since the 1960s the greenback has lost as much as 95% of its purchasing power to other major currencies, but it has been strong since the 2007 recession. There is a precedence for this. 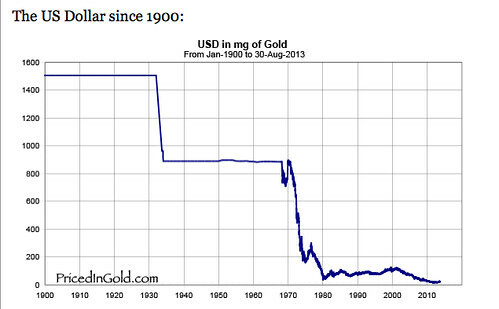 After the other terrible recession in the 1980s, the US dollar became the currency of choice for about five years. Then after the recession ended, it took a terrible fall. Investors have fallen back to the dollar again and again in times of fear. They do not know where else to invest. This is a short term emotional response that is fundamentally wrong. Factor #2: Congress. Congress has just days left to approve lifting the $16.7 trillion borrowing cap and a government operating budget. If this does not happen… an increasingly likely prospect… the government will shut down and the US could default on its debts shortly after. This is a first-ever scenario which could throw the dollar into a tailspin at any time. The $16.7 trillion debt limit was breached last May but the government has continued by using emergency measures such as not funding pensions for federal workers to stay open. The Treasury says it will run out of options around mid-October and could default around that time. However a US dollar crunch could come sooner… at any time in fact, because investors may lose confidence and stop reinvesting in U.S. government debt. If this happens and bond investors switch to other countries’ bonds… the greenback’s snowball downwards could turn into an avalanche. Every Thursday, the Treasury pays about $100 billion to investors. Normally these investors roll over the investment. If they lose confidence and want to be repaid instead, the Treasury’s entire cash balance could be wiped out leading to default. In other words, America… right now is living from payday to payday. Any Thursday payday could stop. This would likely cause a crash on Wall Street and hurt the US economy, business and the public with a sharp and high increase in interest rates. The administration acts as if it is expecting a shutdown and the Office of Management and Budget’s director has sent memos to federal agencies outlining preparations for closure. Congress will most likely get their act together… again but this could cause an emotional panic and force the dollar down. This emotional weakness is important because the US dollar should not be so strong anyhow. The dollar has been buoyed for some time by inertia… not by strong currency fundamentals. Factor #3: Weak Fundamentals. 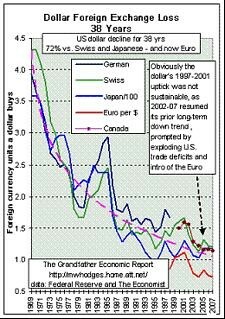 The forces that support a currency are weak in the US. Other currencies have better fundamentals. 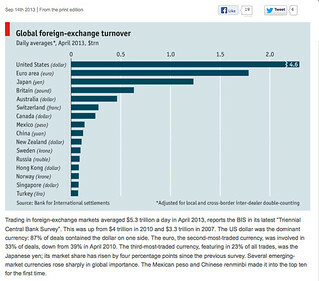 Start for example with the Mexican peso and how it protected its purchasing power over the past five years. At the bottom of the 2000 recession when investors were flocking to the US dollar, I invested in Mexican Fixed Rate MXN 780.000 with an 8% coupon. They mature December 2015 and are still in my portfolio. I purchased at a premium of 103 ($10,000 of these bonds cost $10,300) so my yield has been 7.30% per annum for the past four years… plus as you’ll see I have enjoyed a forex profit. When I invested in these bonds, each dollar I invested purchased 13.6 pesos. That means that each peso was worth 7.35 cents. I would like to say I was a hot shot and made the investment in February 2009 when the peso had drop temporarily to 15.3 pesos per dollar. I did not. I do not ever try to capture the absolute tops and bottoms…for a reason. This is multi currency diversification, not multi currency speculation. I invested in these bonds when the peso was a bit stronger… as mentioned 13.6 pesos per dollar. I immediately made a nice forex profit as the dollar fell from 13.6 pesos per dollar to 11.3 pesos per dollar. That was a 15.4% forex profit in nine months. I did not take that profit though. This is multi currency diversification, not multi currency trading. I was not looking for a short term speculation but a long term profit. The US dollar strengthened again. Today each US dollar buys about 12.9 pesos. This means that each peso is worth 7.75 cents. In other words every 10,000 peso bond I bought was worth $735 at purchase. Today each 10,000 pesos is worth $775 and the dollar is trading down versus the peso. I am still earning 7.50% per annum and in 2015, I’ll get my money back with either a forex profit or loss. If the peso has a strong run up in the next year or so, I may lock in the forex profit with a forex contract. Simply put, the purchasing power of those bonds has increased, plus every year I received 7.5% income. Let’s look at what this means in terms of total return. From 2009 till 2015, I get $750 for every $10,000 I invested. In simple return I earn 45% and then I get my money back. Compare that to having invested in a Dow Jones Industrial Index ETF. 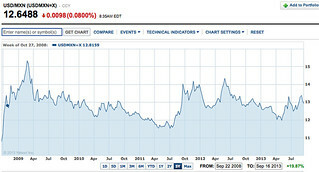 Right now had I invested in October 2009 my return would be about 35%. The Dow has to rise 10% more to match the peso bond return. Of course if the peso rises the Dow would have to climb more to provide an equal return. Why the peso still makes sense. Here are three charts from the Economist magazine. 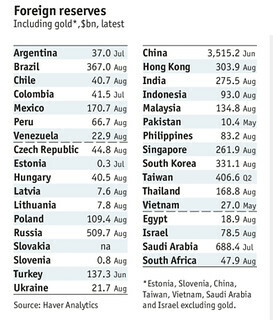 Click on the image to enlarge or go to the Economist Statistics by clicking here. Compare the fundamentals of the US versus Mexico. The first important statistic is the interest rate, 7.75% for Mexico and 2.92% for the US. Budget deficit for Mexico is -1.8% of GDP. The US deficit is -4%. The US current account is -2.7% of GDP. Mexico’s is about half that at -1.4%. These fundamentals suggest that the peso with strengthen versus the US dollar. This next chart shows that Mexico has strong foreign reserves. Click on the chart to enlarge or go to the Economist chart by clicking here. Finally this chart shows that the Mexican peso is the 8th most traded currency in the world so there is plenty of liquidity. Jyske Bank’s website says: We recommend investors to BUY MBONO 9.5% 2014 as we find that the bond and the currency offer reasonable return potential. 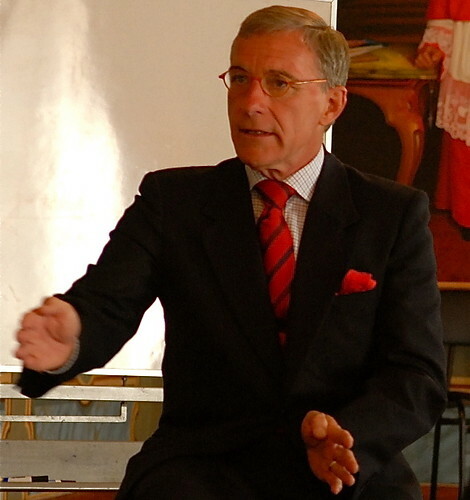 We estimate that there is basis for a strengthening of the currency. However, a number of factors may weaken the currency in the short term. Sustained moderate growth in Mexico and the US and the Fed’s initiated scaling down of its purchase programme involves a risk of affecting the currency adversely. It is important to keep an eye on particularly two issues with respect to our expectations of a strengthening of MXN over the next 12 months. Firstly, that energy and fiscal policy reforms will be implemented and, secondly, that growth will improve in H2. We expect that both of these factors will materialise. There is still potential of a number of upgrades of Mexico’s credit rating, and Mexico’s proximity to the US will be beneficial. This bond yields about 3.5% per annum at this time. 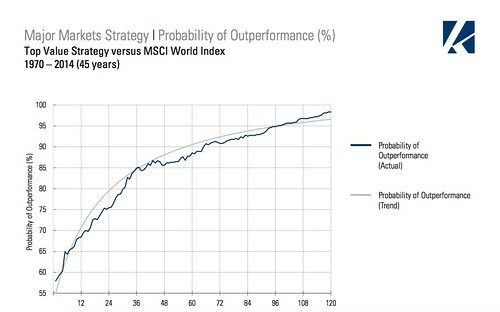 There is one more step that investors with a more speculative nature can take. Borrow US dollars in the 3% range and invest in pesos in the 6% range. The idea behind this Borrow Low – Deposit High Strategy is to take advantage of the interest differential called the “positive carry”. This creates additional income and potential for increased forex profit at the cost of risk from forex loss. We will review how to calculate risk reward on such speculation at the upcoming International Investing and Business seminar October 4-5-6. The bond that matures in 2104 does not pay high enough interest now, but longer term bonds do such as the 8% Mexican Bonos maturing 07-12-2023 is rated Baa1 A- and selling at 114.34 yields 6.11%. You borrow for 3% and invest for 6.11%. An easy way to invest in the peso is with the ETF iShares MSCI Mexico Index Fund (EWW) launched in 1996 on the New York Stock Exchange. This is an easy way to invest via the Mexican Stock Market into pesos, but of course has the normal market risks. The iShares MSCI Mexico Index Fund seeks to provide investment results generally equivalent to publicly traded securities in the Mexican market, as measured by the MSCI Mexico Index. You can learn more about investing in a diversified portfolio of ETF from Morgan Hatfield at mhatfield@ruggiewealth.com . In the past year we have also looked at the potential of investing in Singapore dollars. We also looked at how we sort of cleaned up with a Yen dollar- Multi Currency Sandwich. See ENR Asset Management’s six currency diversification recommendation here. We will look at the seven best currencies to invest in now at our International Investing and Business Seminar October 4-5-6. To help you see a bigger picture I have posted a free report for all readers entitled “US Dollar Protection Review“.